Only a fortnight ago, and so much has happened since. I wrote an open letter to the chief executive of train operators Govia Thameslink Railway, Charles Horton, on this very website. It was read, along with another blog elsewhere, by over 100,000 people (picture above by Summer Dean). Since then, we have lost a prime minister, membership of the European Union, most of the shadow cabinet, a Ukip leader and an England football manager, and Horton has finally appeared before the parliamentary select committee jamboree that is becoming de rigeur for managers who have made very public mistakes. He wasn’t given an easy time. You can read the watch his performance here. His main message is that the extraordinary chaos unleashed on the railway lines of southern England by their franchises – Southern, Thameslink and Gatwick Express – will not be permanent. I watched Horton’s evidence with growing scepticism. 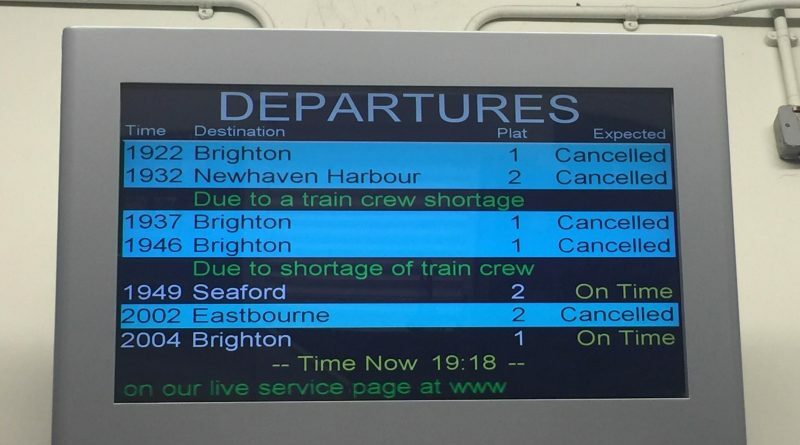 I’m sure that Southern train services will improve. It is hardly possible that they will stay quite as bad as they are now, and I suspect – as the possibilities of a general election loom – that rail minister Claire Perry may not provide them with the public support which she has been giving. But don’t let us relax yet. There are three fundamental reasons why some chaos will continue for the rest of the year and beyond – or until ministers finally wrench the GTR franchises from the sweaty grip of the Go Ahead group. It is convenient for the official mind – and no mind was ever so official as the managers of GTR – that, if something has gone wrong, somebody must be doing in deliberately. It isn’t actually clear that union members have been taking any action of the kind. Why might this be? Because they are easier to cancel? Because there are more of them? I don’t know, but it casts doubt on the central claim of the GTR managers: that Southern passengers will be better off without guards. And casts doubt on Charles Horton’s recent reassurance that services will improve later in the summer.The real problem is worse than that, for reasons I set out in my book about the Southern Rail crisis, Cancelled! It is that, because GTR are not alone, their failure to run an effective service implies that those public service operators which are using the same management techniques – highly centralised, bull-in-china-shop style – also have no effective information from the front line. They are therefore vulnerable to the same collapse. It reflects some of the findings of the Chilcot Inquiry. Running everything from the centre, armed only with a fantasy that you only have to order something and it will happen (the Blair government called this ‘modernisation’), leads to chaos. This goes to the heart of the looming tragedy about so many privatised services, given to operators which are poorly run, managed by finance functions, and are only really effective at one thing – providing the target data to their commissioners which purport to show services improving.They are in the grip of the core IT fantasy about services – that the centre can see and understand all things by measuring them, and that leadership is somehow old-fashioned. It is a recipe for disaster and the first disaster has been Southern Railway. But only the first disaster.